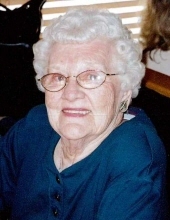 Mrs. Harriett Dolores Lofshult, age 91, of Billings, Missouri, passed away on Wednesday, July 25, 2018, in Republic Nursing and Rehabilitation, Republic, Missouri. She was born on March 23, 1927 in Le Mars, Iowa, where Harriett grew up, the daughter of the late Harry and Louise (Snave) Schrooten. Harriett met her husband, Clarence David Lofshult, in Sioux City, Iowa, and were married on September 21, 1946. To this union two daughters were born. The family moved to Springfield, Missouri in 1964, and Harriett was employed at Strout Realty. After the daughters had left home, Clarence and Harriett moved to Fair Grove, Missouri for a time, and finally retired in Billings, Missouri. They had been married 53 years when Clarence passed away on March 15, 2000. Harriett had worked in the Billings City Hall until she retired on November 25, 2015. A grandson, Shaun Inman, preceded Harriett in death at the age of 27 in 2006. She is survived by her two daughters, Sandy Inman and husband Fred; and Cindy McCrea; three grandsons, Chuck Inman and wife Dawn, Doug Inman, and Eric Inman; three great grandchildren, Hezekiah Inman, Shaela Inman, and Lydia Inman; and a great-great granddaughter, Eza Mae Inman. The family would like to thank Mercy Hospice; The Maples; and Republic Nursing and Rehabilitation, with a special thanks to the staff of A Hall, for their wonderful care and concern for their mother. To send flowers or a remembrance gift to the family of HARRIETT DOLORES LOFSHULT, please visit our Tribute Store. "Email Address" would like to share the life celebration of HARRIETT DOLORES LOFSHULT. Click on the "link" to go to share a favorite memory or leave a condolence message for the family.